Sunny and cloudy mountains, a vineyard, a downtown full of unique restaurants and shops, some sips of Lithia water, and grandparents’ day at granddaughter Lucy’s school = my time in southern Oregon. My trip went by much too fast. It’s wonderful to get away and also wonderful to return home. This week I hope to finish my Resistance Rug #1. I found some embellishments for Resistance Rug #2 while I was away, so finishing that rug comes next. Then what? I have some ideas for a series of Earth rugs, which I need to bring forth. Sometimes designs give life to themselves and an artist is just the conduit. There’s a lot of beauty out there. I never tire of looking at Grizzly Peak. Here it is as a storm approaches. The sky had an eerie yellow cast to it. While enjoying a bit of Oregon's grape we witnessed a controlled burn on the mountains. I love to see the organized rows of grape vines. Oregon's climate makes for some delicious grapes and wines made from them. The town of Ashland is known for its natural lithia water springs. It does come with a warning, however. 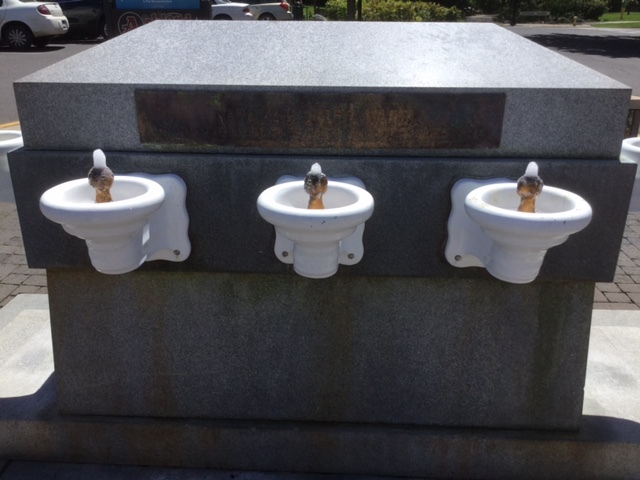 The lithia water public fountains are always bubbling. Lithia water has a sulfurous taste. Not pleasant, but worth a try.